The brackets are set for our annual Chadron Rotary Basketball Tournament! The tournament will be played on December 29 & 30th at the Chicoine Center on the CSC campus. 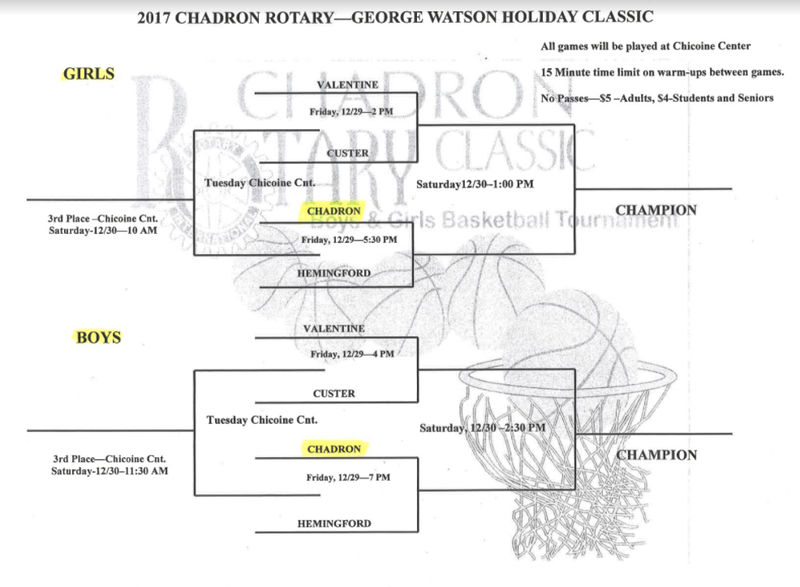 Chadron will open against Hemingford with the girls game at 5:30pm followed by the boys at 7:00pm on December 29th. Come early to watch Valentine and Custer compete with games beginning at 2pm. A quick glance at how well Chadron High School's ACT scores compare to 12 other panhandle schools. The tradition of academic excellence continues! Amazing!!! Nearly a third of Nebraska juniors already met ACT benchmarks! LINCOLN, Neb. (AP) - Newly released test scores indicate the majority of last year's Nebraska 11th-graders would struggle to get good grades their first year in college. The Omaha World-Herald reports that's based on ACT exam scores released Friday. The report says fewer than a third of the 22,300 students who took the exam during state testing in the spring met ACT benchmarks designed to predict success in typical college freshman math, science and English courses. The score release marks the first time state officials, parents and policymakers have a nationally recognized gauge of how well-prepared all Nebraska 11th-graders are for college success. Last year was the first that every high school junior in Nebraska public schools was required to take the ACT. Without knowledge of the ACT test or benchmark scores, an initial reaction would be of disappointment. So, let me try to add some information for those less familiar. First, the state chose to use the ACT as the official state test for all high school juniors instead of the previously used NeSA test. The previous NeSA test was aligned to content standards for each subject. The ACT is a college-prep exam and not aligned to state standards. In other words, the test is of a much higher academic level and intended for college-bound students. Nebraska chose to move to the ACT in an effort to 'raise the bar' of expectations for student opportunities after high school. There are benefits of using the ACT test for students, however, it probably is not appropriate for every student. For example, it has not been the intent of Chadron High School to send every student to a four-year institution after graduation. In fact, that would not correlate with the job market and would put many students at a disadvantage by creating student loan debt unnecessary for successful careers. Our goal is to provide opportunities for students to pursue a successful career after high school, many of which require specialized training of skills ...but not a four-year degree. Here's a quick example of the national job market which is similar to statistics by the Nebraska Department of Labor. 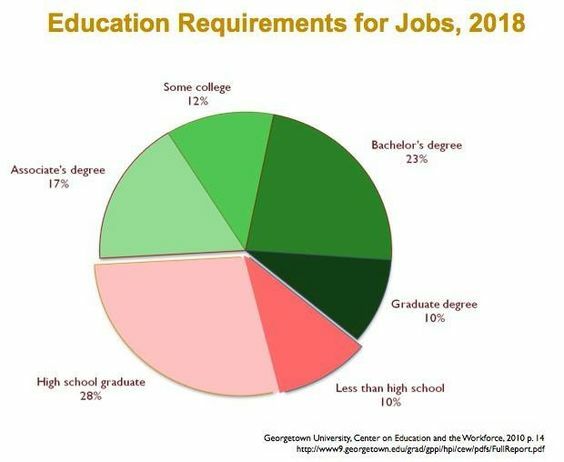 This graph shows only 33% of the job market requires a 4+ year degree. To recap, the ACT test is not aligned to standards intended to be mastered by every student. Please keep in mind, 'every' student means 'every' student, whether the student is diagnosed with learning disabilities or is learning English as a second or third language, every public school junior in Nebraska is now tested with the ACT exam. Again, Nebraska is trying to raise the bar even higher for public high schools in the state and has set ACT benchmark scores in each subject. You might know that the ACT subject and composite scores are from 1-36 (the Writing exam is scored 2-12). Last year, Chadron High School had our first perfect score in many years (we don't have data indicating when it was done before). The national average composite score is 20.8, the state average is 21.4 and CHS averages 22 all for graduates who have voluntarily paid to take the ACT ....but that isn't the average for when EVERY student takes the exam. Since 2017 was the first year for every junior to take the ACT, we can now report that the state ACT composite average for all juniors was 19.3 while CHS juniors averaged 20.9. The benchmarks are set to indicate a high probability of success in core content courses at a four-year institution. Obviously, given more than a year of high school courses remaining, we're confident that these students can increase subject and composite ACT scores if they volunteer to take the ACT again prior to graduation. 2,090,342 of high school graduates or an estimated 64% of the graduating class, took the ACT. Notice 64% of graduates, not 100% as Nebraska now requires. Only 26% met ACT College Readiness Benchmarks on all four subjects. So, nearly a third of Nebraska's juniors already met ACT Benchmarks? 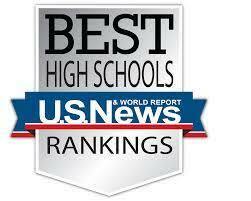 Once Again, Chadron High School Exceeds State Averages In New Testing! Chadron High School outperforms state averages in the new ACT state testing! 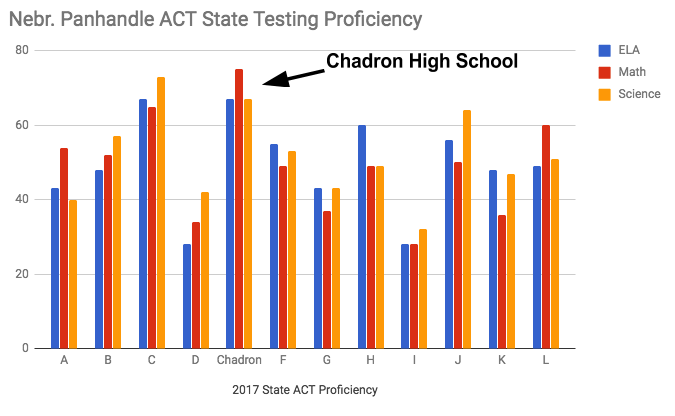 Since this is the first year for Nebraska high schools to use the ACT for state testing, we have no comparison or trend data from previous years, however, we can see that Chadron High School exceeded the state averages once again in all subject areas, in fact, CHS juniors were 13-25% higher in proficiency than the state in every subject tested. *“On Track or Above (Proficiency)” is a combination of students scoring ‘On Track’ and at ‘Benchmark’ on the ACT, roughly an ACT score of 18+ for each subject. The test is taken in April of the junior year, meaning students have 10 months of high school curriculum remaining before graduation. The Nebraska State Accountability (NeSA) testing changed in 2017 for all public high schools. The ACT test replaced the state-created exam used in previous years for juniors (11th is the only high school grade tested). The ACT is the nation’s most popular college entrance exam accepted and valued by all universities and colleges in the United States. The move to the ACT test was made in an effort by the state to ‘raise the bar’ in expectations for successes beyond high school. Developing - Students are likely to need developmental courses before being able to access credit-bearing first-year courses in the majority of Nebraska postsecondary institutions. On Track - Students are approaching the ACT College Readiness Benchmark and are likely to be able to access credit-bearing first-year related content courses at some Nebraska postsecondary institutions without remediation. ACT Benchmark - Students are equipped to enroll (without remediation) and succeed in a credit-bearing first-year course at a two-year or four-year institution, trade school, or technical school. Students have at least a 50% chance of getting a B or better and a 75% chance of getting C or better in a first-year related content course. The composite average for CHS juniors was 20.9 compared to the state average of 19.3 and national average of 20.8 (the ACT is voluntary for college bound students nationally versus mandated by Nebraska juniors). Looking at results of the complete ACT test, 49% of CHS juniors met 3 or 4 ACT Benchmarks compared to the state’s 29%. 32% of CHS juniors met all four Benchmarks compared to the state’s 19%. Over half of our students are already at the ACT Benchmarks in ELA and Math with over a year left of high school courses since testing was conducted in April of the junior year. The CHS Writing average was 6.7 compared to the state average of 6.3 (score ranges of 2-12).